It has always been said that a happy customer will be a repeat customer. Since landscaping is a job that is never done, it is important to gain a customer base that will return to you for repeat business. Happy customers will also give referrals which can be invaluable for growing your customer base. They are also likely to give you a positive online review which will show off your customer service to the potential customers searching on the internet. 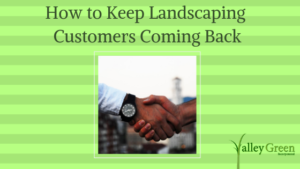 Here are some great ways on how to keep landscaping customers coming back. One of the easiest to get a repeat customer is to stay in touch with them after you complete their initial service. Invite them to follow you on social media and ask if you could add them to your email newsletter list. You could even send them a special thank you note. Handwritten notes are very rare these days and people often forget how great it is to receive one. You can also collaborate with your fleet and choose a day to give back to your local community. Helping out the community often stands out and will your company noticed by new and old customers. This will also help in getting the customers to feel good about doing business with you. Another way is to make it easier for the customer to reach you. Nothing is worse than having to wait more than 24 hours for a call back for a customer that wants to a repeat service done by you. It is a good idea to appoint a go-to person that can do this. This person could also handle social media messages and formulate a diplomatic response to any negative reviews that may pop up. This person should be friendly, efficient and organized. Annual open houses and seminars are a great way to encourage new and repeat clients to sign up for services. Many fleets opt to do this at the beginning of the season. Ratchet up the fun by having a free barbecue. This can be a great time to let your customers meet your employees face to face which is a great way of establishing a good rapport. Be sure to list any new services or products that you want customers to partake in. If you can, set up a demonstration area. Do you have any tips on how to keep landscaping customers coming back? Please list them in the comments. Valley Green was founded by Charles Dooley in 1990. Headquartered in Holyoke, Massachusetts, we have grown to eight branch locations supported by inside & outside sales associates specializing in turf seed, sod production, golf sales, turf maintenance, nursery production, agriculture and arboriculture. The average green industry tenure at Valley Green is well over 20 years per associate!